I am overwhelmed, but not surprised, by your outpouring of generosity and responsiveness to the tragic disaster in Texas and the Gulf Coast. So many of you have contacted me about how you or your clubs can best donate. The Rotary Foundation has now established another option for those of you who would like to provide support directly through your own account with the Rotary Foundation. The exact name of the Fund is The Gulf Coast Disaster Relief Donor Advised Fund #608 Go to https://www.your-fundaccount.com/rotary/HowToContribute.asp. Every time I have the privilege of visiting a club, I am reminded anew why I love Rotary. For me, it’s about the people, the projects and the power. Rotarians are people of action with generous spirits and integrity. We share our diverse thinking, skills and resources to be a global force for good. Our projects, whether large or small, are impactful and we make a difference in countless lives. Our power lies in our ability to collaborate and multiply our capacity, using resources like District and Global Grants, and the Rotary Foundation. It warmed my heart to see so many. Rotarians at Glenn's. Memorial Service. I'm sorry I did not get around to seeing each one of you. Thank you also for all the wonderful cards. It is the hardest thing I have gone through but am taking it one day at a time. I will return to Payson after the 1st of the year. The kids just could not leave me there. Will get through the holidays this way without my Gentle Glenn by my side. Washington High School Interact, Glendale, AZ supporting orphaned children at Open Arms Home for Children, South Africa. Throughout the school year Washington Interactors participate in making “kid-sized” quilts - 68 of them this past school year! These quilts recently make the journey (over 10,000 miles!) from Glendale to the Open Arms Home for Children near East London, South Africa (http://www.openarmshome.com/). Scottsdale Sunrise Rotary delivered dictionaries all third graders in six Scottsdale Elementary Schools, Kiva, Navajo, Pima, Pueblo, Tavan and Yavapai. Teams of Rotarians met with the third graders and explained the dictionaries and walked through a couple of uses for this fantastic book. Everyone was excited to get their dictionary. This is a wonderful project for our club. 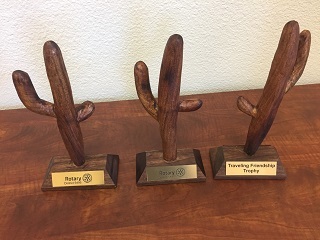 In an effort to promote club interaction and get to know each other better, during the inaugural D5495 year there will be three travelling friendship trophies to be circulated throughout the district. The clubs will be responsible for passing the cactus to the next designated club. This could be done either at a regular joint meeting, a joint club social or some other gathering. The details are up to each club. 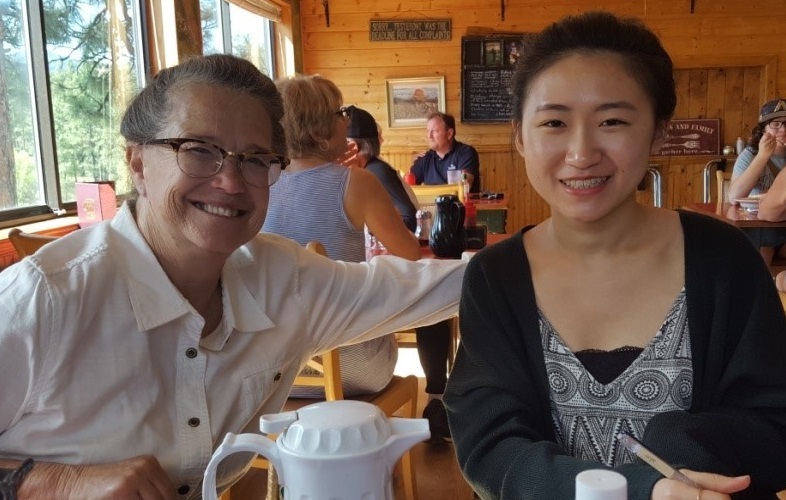 Wu, Wen-Yi (also known as “Anita”) a New Generations Service Exchange young lady from District 3520, in Taiwan, Sponsor by the Tamsai Rotary Club and being hosted by District 5495 and the Frontier Rotary Club, Prescott, arrived in Phoenix on August 3, 2017. The Rotary Club of Sun City Satellite is having their first fundraiser on Sat Sept 23rd . It will be an Applebees Flapjack fundraiser at the location of 8001 W Bell Rd. Peoria, Az. 8AM to 10 AM. Are you looking for an international project? It is our pleasure to invite you and your Club to attend our XIII Rotary Project Fair to be held in Guayaquil at the Hotel Oro Verde on Friday 17th , Saturday 18th , and Sunday 19th of November, 2017. Our youth exchange year is underway! Our first class of District 5495 Outbounds are making their way across the world to stay with their host families and attend school in their host country. We welcomed our new Inbound students to Phoenix and Las Vegas on July 29th. The Phoenix Walk to End Alzheimer’s happening November 11, 2017. We are currently looking for presentation opportunities to let everyone know about the walk. This is our largest fundraising event of the year and are looking for help in fundraising along with many volunteers to make this event run smoothly. The Rotaract Club of ASU at Arizona State University and the Rotaract Club of Phoenix are both very active! 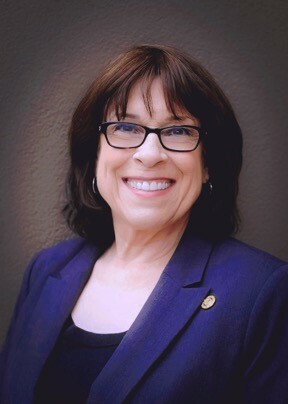 Rotarian/Past President of Rotary Club of Scottsdale. David Arriola, presented to former Club member, John Wintersteen, his Paul Harris Fellow Plus Two Recognition pin, as well as, his "wings" insignia to add to his Paul Harris pin for his becoming a Rotary International Foundation Benefactor. 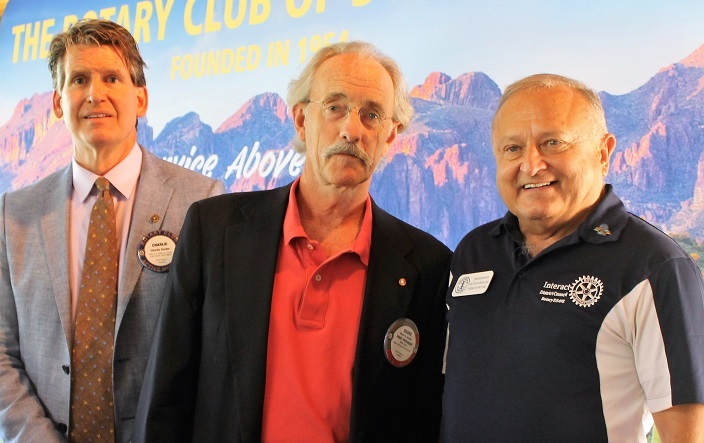 John, a Rotarian since 1966, is currently a member of Southwest USA E-Club Rotary Club and serves at Rotary District 5495 District Youth Services & Interact Chair. Rotary Interact clubs bring together young people ages 12-18 to develop leadership skills while discovering the power of Service Above Self. 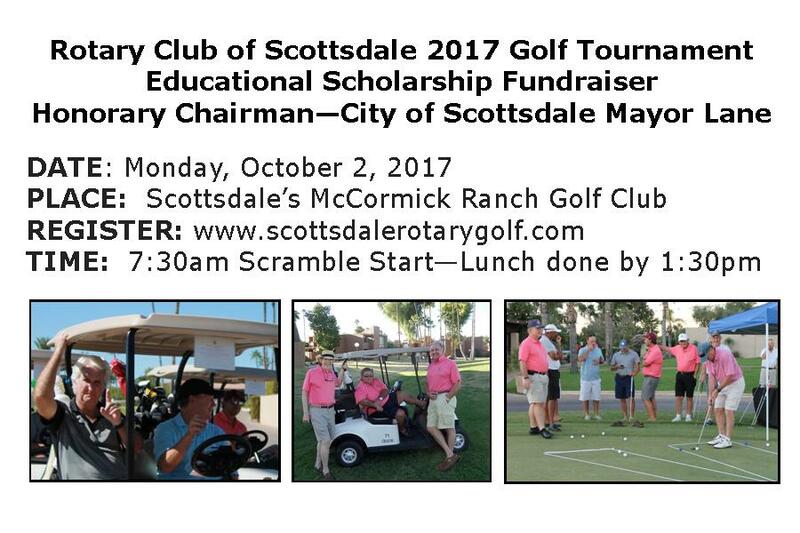 Rotary Club of Scottsdale 2017 Scholarship Golf Tournament at McCormick Ranch Golf Club, Scottsdale. Start early, finish early with 7:30am Shotgun and done by 1:30pm. Featuring Silent Auction with top-level gifts & experiences. Fee just $100 per player - includes golf, drink tickets, snacks, and awards luncheon with many surprises. All proceeds are directed towards 2018 scholarships. 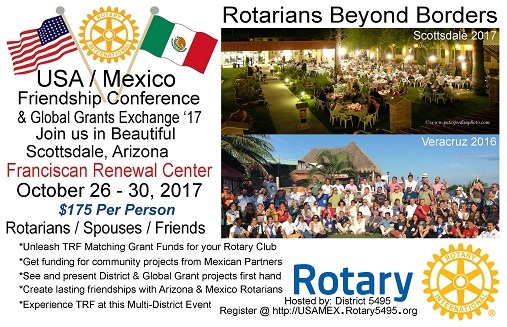 Learn more and register at www.scottsdalerotarygolf.com. UPDATE: $1300.00 Raffle prize drawn by Guest Cindy Weiss picking for Jim and Ron Congratulations! Will the elusive Queen survive another week? In spite of a $1350 plus bounty, the reclusive Queen of Spades remains under deck awaiting some lucky winner. District 5495 Area 17 Fired Up! Things were literally on fire at the August 2 meeting of the Sedona Red Rocks club with the surprise celebration of member Raye Speirs’ birthday. A cupcake display was set ablaze with all 90 of the candles necessary to commemorate Raye’s nine decades of life. Sedona Fire Marshall Jon Davis, sporting full firefighter gear, rushed in amid much laughter to help control the conflagration. 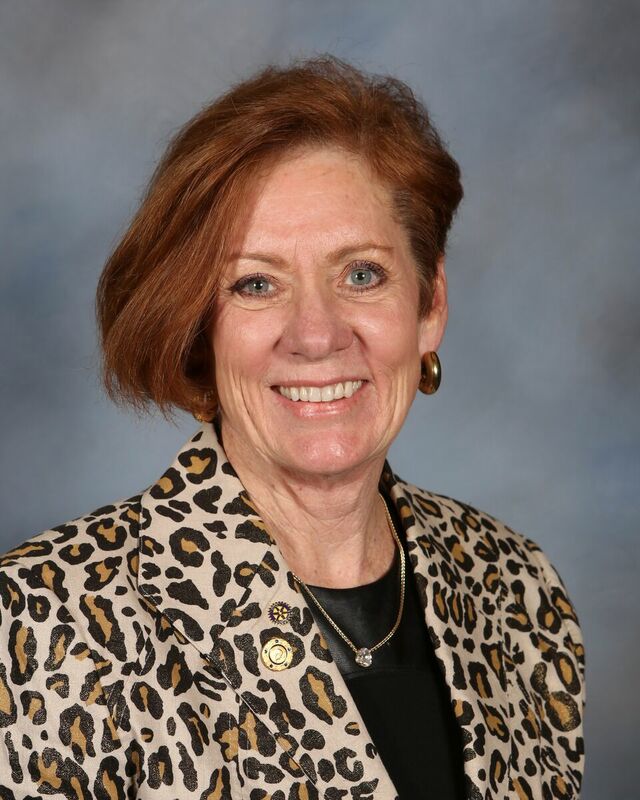 Raye is not only an active board member but got things rolling for the club’s first Red Rocks Fashion Show which will showcase styles from seven local boutiques at the September 7 fund raiser. Other fund raising events on the Red Rocks calendar are Glow Golf the night of September 15 and its annual Oktoberfest event October 21. Rotary Club of Scottsdale is honored that its global grant application for funding to provide a scholarship to Ms Carlyn Harris to receive a Master of Public Health from the University of Edinburgh, Scotland, submitted by the Club and the Rotary Club of Edinburgh, has been approved by The Rotary International Foundation. The award is in the amount of $30,000. Thanks to the generosity of the Hartley and Ruth B. Barker Endowed Global Grant Scholarship, the two Rotary Clubs and Ms Harris will be receiving $30,000 in funds from this gift to finance the grant. Ms. Harris's area of focus is disease prevention and treatment. Almost everyone loves a parade. There are many annual community parades in Arizona every year, which draw significant numbers of spectators. 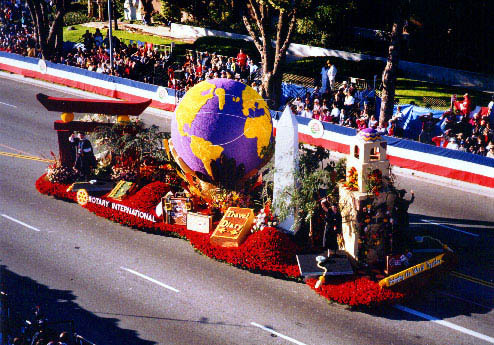 Several of these parades take place in the winter holiday season and there is a group of Rotarians currently looking into the possibility of constructing a Rotary float that could be used in multiple parades to bring a little extra recognition to Rotary and all of the great things we do in Arizona and around the World. The Rotary Eclubs of District 5495 are great resources to clubs through the ability to help share information online through our programs that can be accessed 24 hours a day 7 days a week. Our constant online presence enables us to help promote your ongoing efforts and serves as an additional media channel to promote the good you are doing in the world. 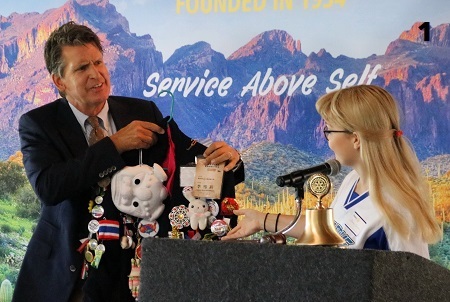 When RI President Ian Riseley challenged Rotarians around the world to plant a tree for every Rotarian last spring, Sun City AZ Rotarians responded immediately. They met with members of Sun City PRIDES, a community service organization of volunteers who maintain Sun City’s public areas. The Desert Canopy Project was the perfect project for everyone -- planting new drought-resistant, broad-leaf trees to beautify and shade the City’s streets. 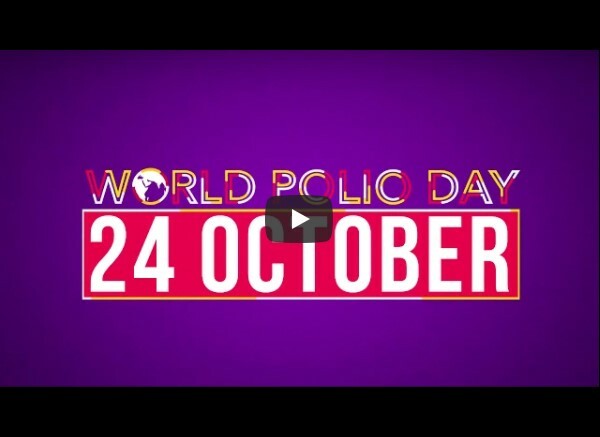 How will you Celebrate World Polio Day on October 24th? District 5495's FIRST Rotary Foundation Dinner Celebration is coming up on November 4th. Let's make it a grand occasion with a BIG turn-out from our clubs! This is our Foundation and our biggest tool to "Do Good in the World"! 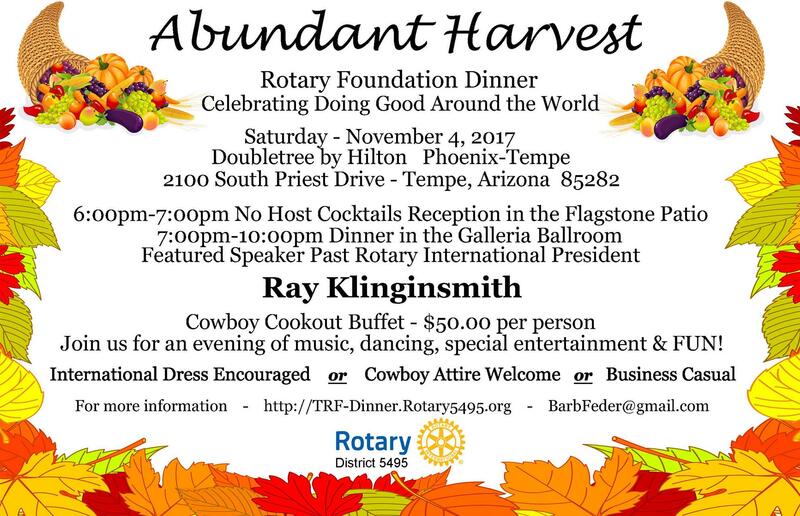 Join your Rotary friends to celebrate the "Abundant Harvest" our Rotary Foundation provides near and far. Register today and be sure to bring another club member with you!